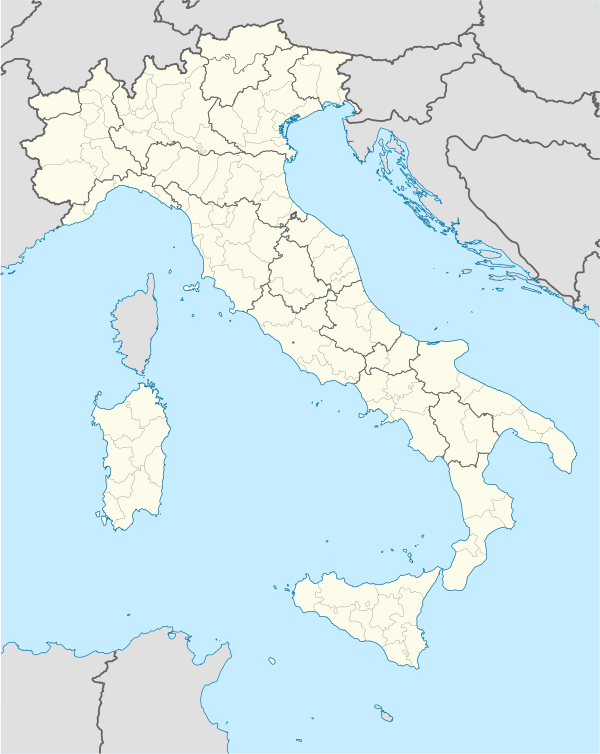 Adrano (Sicilian: Adranu), ancient Adranon, is a town and comune in the province of Catania on the east coast of Sicily. It is situated around 41 kilometres (25 mi) northwest of Catania, which is also the capital of the province to which Adrano belongs. 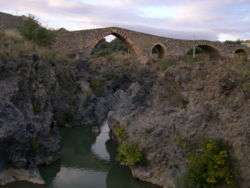 It lies near the foot of Mount Etna, at the confluence of the Simeto and Salso rivers. It is the commercial center for a region where olives and citrus fruit are grown. Neighbouring towns include: Biancavilla, Bronte, Paternò, Randazzo, Santa Maria di Licodia and Centuripe. The settlement was founded by Dionysius the Elder around 400 BC, intending to strengthen Syracusan power in the region. He named the town Adranon in honour of Adranus, a deity of Phoenician origin. In 344 BC the troops of Timoleon fought the forces of the Syracusan commander Iketas of Leontini near Adrano. During the following years, Adrano was frequently harried by Campanian mercenaries, called the Mamertinians. The Romans conquered the growing township in 263 BC and declared it a civitas stipendiaria, obliging it to pay a costly tribute to Rome. The consul Valerius ravaged the town, enslaved the inhabitants and sold them as workers and slaves to the aratores (farmers) residing in the near city of Centuripe. In 137 BC, Eunus led an unsuccessful slave revolt against the Roman suppressors, and from then on, Adrano was nothing more than part of Centuripe. The Romans referred to the city as Adranum or Hadranum. The township was pillaged several times by Germanic tribes during the fall of the Western Roman Empire. Only through the reign of Theodoric the Great (495-526), the conditions improved due to the administration by Cassiodorus. In the mid-6th century it was conquered by the Eastern Roman Empire. Around 950, the Arab Musa occupied the city of Centuripe and its vicinity, and thenceforth Adrano became part of the emirate of Sicily. The ruined town of slaves meanwhile was little more than a settlement of various primitive shacks, but the Islamic occupants, which showed to be quite tolerant towards the Sicilians and very skillful farmers, build up a functioning infrastructure around Adrano. Several of their buildings and structures, like the Ponte dei Saraceni (Bridge of the Saracenes) can still be visited around the region. The Arabs reigned the region until in 1075 the Normans, led by Hugo of Yersey, succeeded in conquering the region against the resistance of Caid Albucazar. Adrano became part of the Diocese of Catania, administered by the monk Ansgerius. The citizens of the prospering township continued the successful agricultural and economic work the Arabs had initiated. Therefore, the Norman era was enormously influenced by winegrowing, leather work and silk manufacturing. The arrival of the Hohenstaufen around the end of the 12th century brought enduring difficulties and disputes over Sicily and its inhabitants. The remaining Arabs were vehemently pursued by the administration, which forced them to gather inside the fortresses of Troina, Entella and Centuripe, offering armed resistance. The insurrection was ended violently, and the survivors were massacred or kidnapped. Pope Clement IV made Charles of Anjou king of Sicily in 1265, which ended the Hohenstaufen rule of southern Italy. During that time, Adrano was rather a small settlement of hunters, and the number of inhabitants had decreased from 1,000 to 300. In 1282, the Sicilian Vespers ended the French reign in Sicily, and Peter III of Aragon became king. The following years were characterized by constant conflicts between the residing farmers and the Bourgeoisie of the region. Adrano fell to the property of the Catalonian landholder Garzia de Linguida, and eventually, in 1286, to the ownership of Luca Pellegrino. The estates and soils of the region were subject to immense disputes between several landowners and noblemen in the following time until the 15th century. From the 15th century on, Sicily was reigned by the socalled vice kings. Between 1412 and 1515, Adrano was under administration by the Moncada family. Giovan Tommaso Moncada (1466–1501) renovated the Norman castle and fortified it. He allowed a couple of refugees from the northern Greek region of Epirus to settle down in the vicinity of Adrano, which is how the town of Biancavilla was founded. The relatives of earl Moncada build many manors (socalled palazzi) in the centre of the town, among which is the latter town hall, and the centre of the city, the piazza, became popular meeting place for the residents, who meanwhile numbered around 6,000. Around the same time began the construction of the Monastero di Santa Lucia (Monastery of St Lucy). In 1693, a severe earthquake inflicted heavy damage to the town. Since the beginning of the 18th century and until around 1820, Adrano suffered from enduring riots and changes taking place in Italy and particularly Sicily, as was the Risorgimento. Adrano became the main administrative town of the vicinity in 1819 and hosted the local court. Giuseppe Garibaldi landed in Sicily in 1860 and many reforms took place. On July 1, 1860, a town council was installed in Adrano, and don Lorenzo Ciancio was made chairman. The famous Teatro Bellini (Bellini theatre) dates from that time and testifies to the various diversifications the city underwent in that very period. A hospital was instituted as well, and meanwhile Adrano was considered the wealthiest town in the region. In the 1920s, the reformist preacher don Vincenzo Bascetta appeared in Adrano, and together with the young anti-fascist professor Carmelo Salanitro he passionately fought for the peasants' rights. Due to their initiative, large parts of the surrounding lava landscape were transformed into olive and almond plantations. Carmelo Salanitro died in Mauthausen-Gusen concentration camp in 1945. Adrano suffered massive damage again in 1943 during World War II. The Romans changed the name of the township into Hadranum; during the occupation by the Arabs it was called Adarnu or sometimes Adarna, while the Normans referred to it as Adernio and Adriano. Until 1929 its official name was Adernò, until eventually it was changed into Adrano. Several elder inhabitants of the town still call it Adernò. Castle of Norman origin (Castello Normanno) in the centre of the town, built in 1070 on behalf of Roger I. Inside the castle is the archaeological museum with antique findings of the region. Chiesa Madre (Mother Church), originally a Norman work. Convento di Santa Lucia (Monastery of St Lucy) in via Roma, constructed in 1596 to the order of the prince of Biscari and redesigned by the well-known Catanese architect Stefano Ittar. It contains a chapel dating from 1775. Until the early 1920s, the monastery was still inhabited by monks, but meanwhile it is communal property and partly used by a secondary school. The public Teatro Bellini, which was re-opened in 2004 after over 26 years. It was built on behalf of the vice king in 1779 and resembles the theatre of Parma dating from 1618. It is situated on the ruins of the antique church of St Vito. The ruins of the original Greek settlement visitable in the east of the town. Due to the prospering Catholic tradition of the region, Adrano has numerous antique chapels and small churches hidden in the backstreets. Moreover, Adrano is famous for its colourful carnival and the passionate celebration of San Nicola, in honour of its patron Saint Nicola Politi on August 3. Adrano is linked to the rapidway SS 121 leading from Paternò to Catania. Near Bronte, a large mall named Etnapolis has been opened recently. 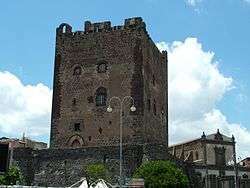 Adrano is connected to the province capital Catania by a bus route which is operated by the FCE and leads through various towns to the central station of Catania and further to the communal beach. A rapid bus skips the smaller towns and leads to Catania directly over the highway. In the summer season, a bus connects Adrano, Bronte, Randazzo, Floresta and Naso in the province of Messina. Between the station of Catania-Borgo and Riposto operates the Littorina, a nostalgic Diesel fuelled train which stops in Adrano, Paternò, Biancavilla, Santa Maria di Licodia and other towns. The extension of a route of the rapid transit railway of Catania to Paternò and Adrano has been planned and the constructions have begun. Adrano is not linked with the national train system of Trenitalia. Moreover, the FCE operates two bus routes (A and B) in Adrano. Adrano does not possess any hospital but only a socalled Guardia medica, a paramedic station with emergency personnel, vehicles and equipment. The nearest hospital is the Maria SS. Addolorata in Biancavilla, which is on stand-by as well for emergencies in Adrano. Wikisource has the text of a 1911 Encyclopædia Britannica article about Adernò.